This page is for the first edition of the book. I have since completely rewritten the book from scratch. Though the general principles underlying this book remain the same, the new book has better prose, updated material, a somewhat different (and better) technical presentation, and fewer pages. The second edition is available online, and I update it frequently. The PDF version is still a bit rough, and needs more attention to formatting. I will attend to that after I'm done writing the content. Because my focus is on this new edition, I am requesting that you not send me bug reports about the current edition. Of course, questions and technical comments are always welcome. Please see my brief essay about the educational philosophy behind this book. 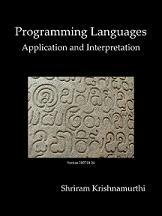 In particular, I discuss why this is a much more appropriate book for a modern programming languages course than a traditional one based on “paradigms”. Does Anyone Use This Book? At present, I am aware of 52 universities (and some high-schools) that have used part or all of the book. Users range from major research universities to liberal arts colleges, from public to private universities, and cover four continents. If you're an educator (teaching at a University, College, High School, Grammar School, Hochschule, Gymnasium, etc. ), please let me know! You can download the April 26, 2007 Version as a single PDF file (~1.4Mb), free-of-cost. If you prefer, you can also pay to download. No, this is not a joke. You're being given a choice in case you want to reward the author in kind. You lose nothing, however, by opting for the free version: it really is the entire book, no strings attached. You can buy the book in paperback. 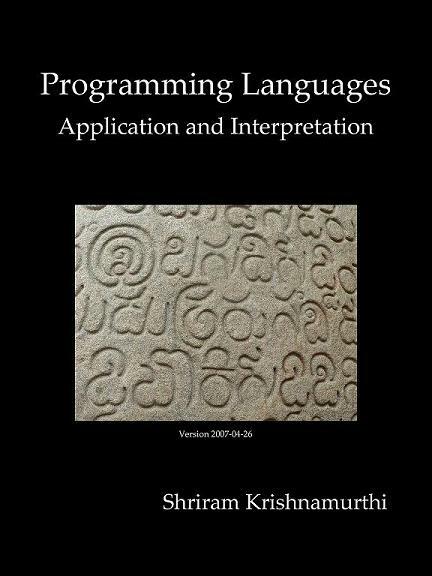 If you are in India, you can get the book on paper for much cheaper via Pothi. Note: Though I trust the person who set it up (thank you for the initiative, Ramakrishnan Muthukrishnan! ), I have not bought a copy to check the output. Also, I don't control any price fluctuations, nor do I get any royalties. Therefore, if you spot any problems, please notify me. However, due to the availability of the second edition, I suggest you not purchase the above volumes. Please instead wait for the second edition to be finalized. Note: For now on, there will be just one language level for the book. There are additional languages to support the garbage collection assignment. Type plai in the Help Desk to get documentation on all of these: click on the entry for the “plai module”; the garbage collection languages are indexed in the table-of-contents on the left. Got the Book, Got the Software; Got Questions?